On any given night during 2018, some 552,830 Americans nationwide experienced homelessness, according to a recent report by the U.S. Department of Housing and Urban Development. That’s a tragic statistic, but it’s only a slight increase—just 0.3 percent—over 2017. A decade-long trend shows a more positive outlook; overall, homelessness has declined by 13 percent since 2010. An innovative “housing-first” approach, which recognizes the importance of stable housing first and foremost, is partly responsible for the improvement. While the people experiencing homelessness are, of course, a diverse group, some fundamental needs are shared. Creating a sense of security, privacy, and dignity is always necessary, says Jill Pable, a professor in Florida State University’s department of interior architecture and design, who runs the website (Design Resources for Homelessness). The best solutions are also participatory, Pable adds. “We must listen to and include these people in the design approach,” she says. As attitudes toward homelessness have begun to shift (last month, Sesame Streetintroduced a storyline about a seven-year-old character who no longer has a permanent home), design has, too. “Taking steps to help these people re-enter regular society,” says Pable, should be any designer’s end goal. Permanent supportive housing, she notes, is the most successful strategy for helping the homeless get back on their feet. But temporary and emergency shelter plays a role, too. From 3D printed houses to flat-pack sleeping pods to community-based apartment complexes, creative solutions—and hope—are on the horizon. 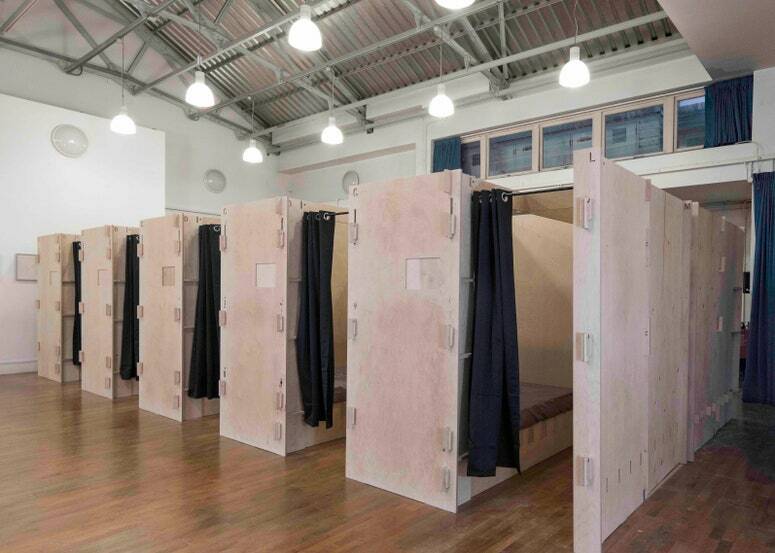 Designed by Reed Watts as temporary bunks, these sleeping pods are fabricated from standard plywood sheets that fit together with interlocking connections and require no screws, nails, or glue to erect. The pods can stand alone or be fitted together, are easy to disassemble, and provide more privacy and security than a standard mattresses on a floor. In Los Angeles, where focus and funding prioritizes permanent supportive housing, Homes for Hope has begun to fill a gap for affordable transitional housing. 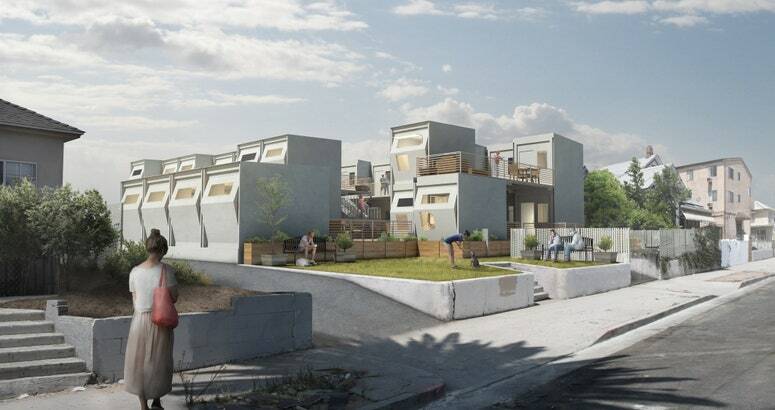 Designed by Mary and David Martin’s Madworkshop with the USC School of Architecture, these 92-square-foot modular dwellings can be installed quickly and inexpensively on unused city land. The stackable units also can be aggregated, then dismantled and reconfigured. Traditional home-building is fraught with waste, but Icon‘s mobile 3D printer can build an 800-square-foot house in less than 24 hours for under $4,000 with nearly zero waste. In collaboration with New Story, a nonprofit dedicated to sustainable building in the developing world (it has also partnered with AD to build homes in Haiti ), Icon debuted its first 3D-printed concrete house in Austin, Texas, last March. Long-term solutions are critical for a successful transition out of homelessness. 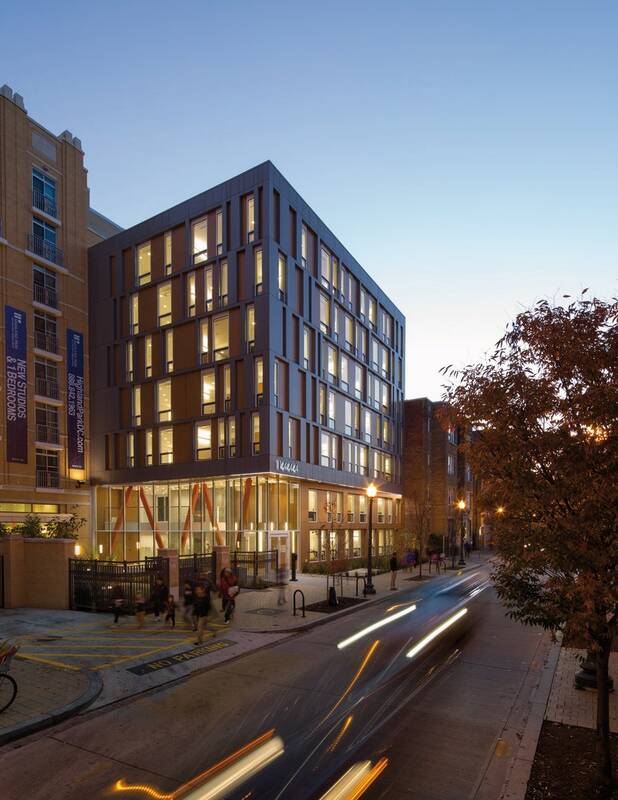 La Casa, in Washington, D.C., by Leo A Daly and Studio Twenty Seven Architecture, is a 26,200-square-foot permanent supportive housing project sited among high-density residential developments. Providing housing and supportive services for 40 people in single-person efficiency units, La Casa provides stability for tenants as well as privacy, safety, and community. 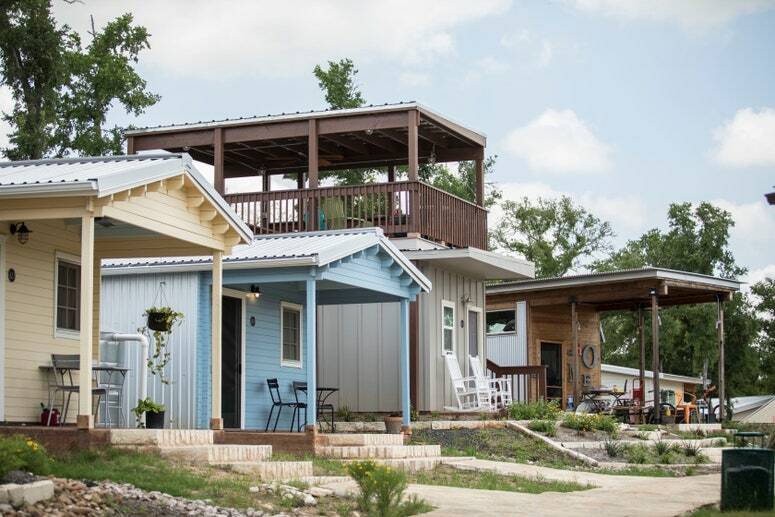 This 51-acre hamlet in Austin, Texas, provides affordable, permanent micro-housing and a supportive community for those transitioning out of homelessness. Alongside its array of adorable tiny homes, the village offers community gardens, medical facilities, a movie theater, and a market, but above all, perhaps, it aims to restore hope and deliver dignity.